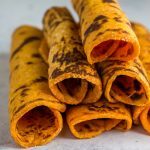 The next big thing in tortillas – these paleo sweet potato tortillas are a grain free, dairy free, nut free, eggless option that will blow flour or corn tortillas out of the water. Vegan and allergy-friendly and just a few simple ingredients for paleo tortillas you enjoy now or freeze for later use! My food freedom is corn. I know, that sounds completely and insanely stupid, but let me explain. I love popcorn. I love blue corn tortilla chips. I love corn Chex. I love corn on the cob. I love corn tortillas. Yep, corn for this girl does a body good. 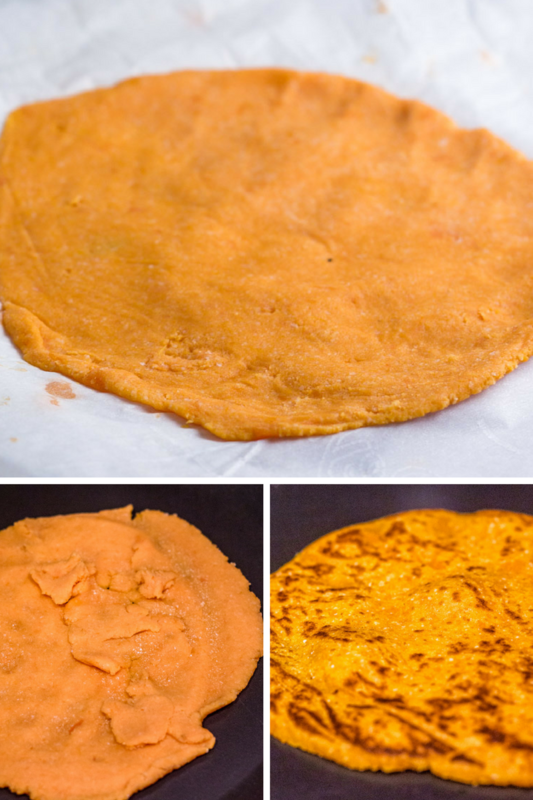 It’s obvious – paleo sweet potato tortillas. This was a spur of the moment ‘maybe-this-could-work’ type of idea that sprung up on me right in the middle of nap time (aka my daily sanity hours) and had me mulling over it all evening – eager to get in the kitchen after the kids went down for the night to get tortilla testing! I am officially I’m a food geek. Now as much as I adore, love, and wish to smash my face with corn tortillas on the daily, these paleo sweet potatoes might be the next big thing for me. Or a big love affair. Obsession if you will. I’ll never not love corn tortillas, I just won’t. But cross my heart this simple, grain-free version of a tortilla tastes totally amazzzzzing – especially with scrambled eggs all nestled inside, or as a turkey avocado wrap, or even just warmed with a little ghee and cinnamon. What might be even better? My very picky 18-month-old LOVED these. The only thing is, then I had to share. Ugh the things we do as moms! 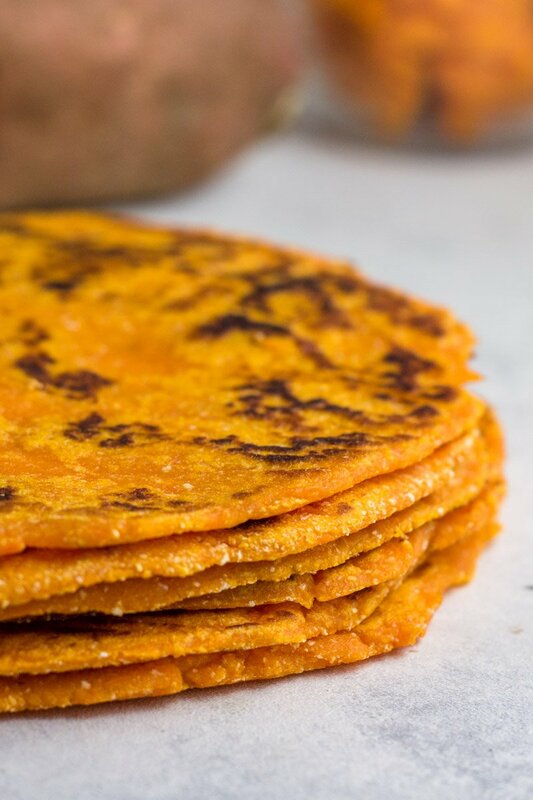 Making these paleo sweet potato tortillas can be a bit tricky, but worth the effort. The recipe makes roughly 4-5 tortillas roughly 7 inches in diameter, so if you are taking some time to make them, consider doubling the recipe and freezing a few for later! the thinner the sweet potato dough is, the better it will compare to a traditional tortilla. If the dough is thick when cooked, it produce more of a flatbread. Both delicious depending on your preference! If the dough breaks as you peel it off the parchment paper before transferring to the pan, you can take a few flattened pieces of extra dough and simple press them on top when you place the tortilla into the pan. You’ll want to do this quickly so you don’t burn yourself! Once you flip the tortilla, you can flatten it a bit with the back of the spatula to ensure it sticks. Like a sweeter tortilla? Add a little cinnamon. More savory? Add a sprinkle of onion and garlic powder. Prefer a little heat? Add a ‘lil paprika and cayenne. When you cook in the pan, watch for the dough to slightly ‘bubble’ before flipping. 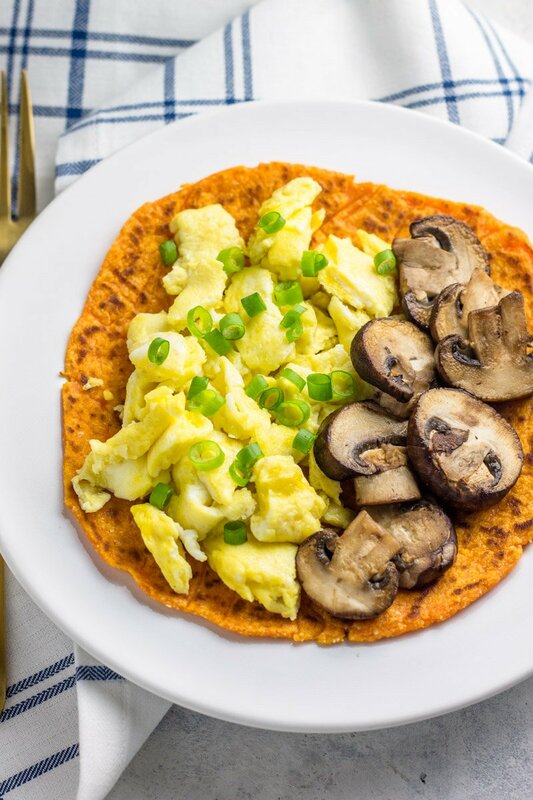 Try these paleo sweet potato tortillas with a few of my favorite eats! Use them as a wrap for these Whole30 Sloppy Joes, or for these Cilantro Pesto Chicken Wraps. Or throw down as a base for these Roasted Red Pepper and Goat Cheese Omelette Bowls. A grain free tortilla recipe with simple ingredients. 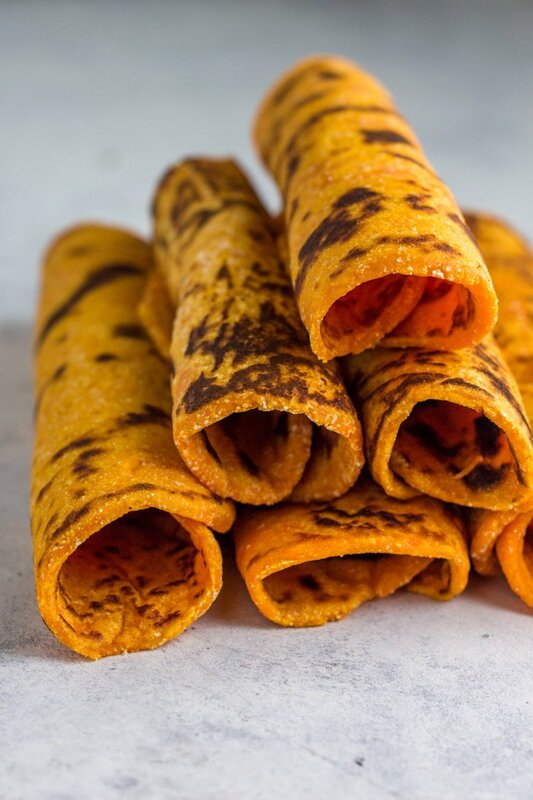 These paleo sweet potato tortillas are sweet yet savory. A perfect addition for breakfast, lunch, dinner! They look AMAZING and surprisingly sturdy yet bendy!? You should definitely try baking them into tortilla chips! Could other flours be substituted? I would not sub any ingredients in this recipe. Is there a substitute for the tapioca flour? I don’t have any and I want to make these NOW! P.s. You’re probably my favorite blogger/instagrammer/social media mom. Keep doing what you’re doing and trusting God, and He will continue to bless you. Arrowroot would be the only sub. Thanks SO much for your sweet note! Thanks so much Lauren! I really wouldn’t sub any ingredients, as I haven’t experimented with any other version so can’t say for certain. I think pumpkin puree will be way too wet. Sorry. These look amazing…and BONUS I already have all the ingredients! Question..how user friendly are they? I’m not super great at cooking so the thought of making a tortilla is slightly terrifying. They seem easy enough? They can be a bit tricky! As you can tell, some of mine ripped a bit, but you can always salvage them with more dough pressed on if they break! These are definitely a finicky recipe because the dough has to be so thin. But if you follow the directions, read the bullets in the post, and use a non-stick or lightly greased pan, you should be good to go! I am so excited to try these! I have a question though..I am allergic to coconut so can you use another flour in its place? Do you use the same amount? Thanks! Hello – Ugh bummer! I honestly am not sure if any other flour would work. You could try almond or more tapioca but it’s a guessing game! Hmmm I am really not sure how a sub would turn out Morgan. You could try almond flour! I’d do a tad less and play as you go. Thanks for keeping the ingredient list short, simple & clean!I really appreciate that. Love your recipes. Thanks for doing the experimenting so we all don’t have to. Of course Angela! Thanks so much for the kind note! Wow! These are amazing. I honestly didn’t think they would turn out as I was preparing them & they were falling apart in my hands, but I worked with them & figured it out. Shrimp tacos with pineapple salsa and these tortillas are so delish! So glad they worked for you Marissa! Your meal idea sound delish! Christopher Walken rocks and he would totally love these. I tried making these last night with my tortilla press (and parchment paper) and the dough was way too sticky and kept falling apart. I ended up just smushing the dough in my hands to make it as flat as possible, but was unable to get them to be very tortilla like. Advice? I followed the recipe exactly. ..
Hmmm try dusting with a little more flour, but I’m not sure I would try it in a tortilla press (although I don’t have one so I’m not sure). I assume the dough was sticking to the press? Try pan fried in a non-stick or lightly coated with oil if you give these a whirl again! It is a tad finicky! I tried to help as much as I could with the bullet points within the post. Sorry they didn’t work out for you! Did you boil and mash or bake and mash? Does it matter? I actually microwave them! Doing that or baking would be best. These are amazing! They are a little chewy by themselves but they were fantastic as taco shells and tasted even better under an egg scramble! Thanks Chrissa! Mine was super sticky and I couldn’t get it off the pan, even though I slightly oiled it… bummer! Do you think maybe I just add a tiny bit more flour? Oh no!! I would guess yes on more flour. I haven’t ever had these stick, but if you did oil the skillet then sounds like maybe a dash more flour would help. OH so good!! I just made these this morning and they are so good! I sprayed my pan with avocado oil spray in between each tortilla since my non stick pan is losing it/s non stickness. Thank you for the recipe i am way to excited to eat these with everything! I’m so happy they turned out for you and you loved them Victoria! Oh I’m SO happy to hear that! Thanks Clarissa and great tip! Are these whole 30 compliant? Technically any tortillas (even with compliant ingredients) aren’t Whole30 compliant. Shoot! I’m so sorry to hear that! The dough can feel ‘doughy’ but typically when spread thin enough will yield a tortilla-like result. But way to improvise! 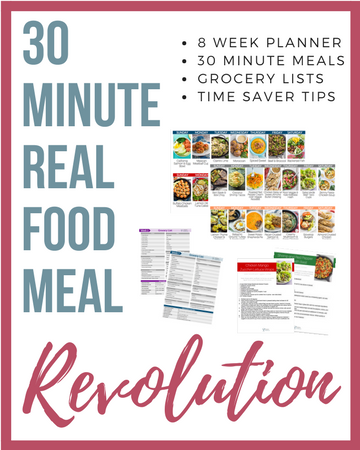 Do you think this would be considered a Swap Out for Whole 30? I am just doing a bit of a reset this week but have the ingredients and have wanted to make these! This is definitely a SWYPO during a Whole30. These worked so well! I was pleasantly surprised. I used a white hanna sweet potato and they ended up looking a bit more like traditional flour tortillas. I flattened them in a tortilla press between two pieces of parchment paper sprayed with olive oil. So easy! I didn’t end up with any tearing or patching. Thanks for a great recipe! Thanks so much for stopping by to give feedback Morgan! If you freeze these how do you warm them up? I just microwave them or you can throw back int the pan for a minute or two. Oh wow!!! This means so much to me. Thanks for commenting Heather – glad you loved them! These are life changing!! I had to up the flours a little to get the right dough texture but seriously thank you!!! My husband makes the best flour tortillas and I can’t eat them and now I can have something more similar than corn. 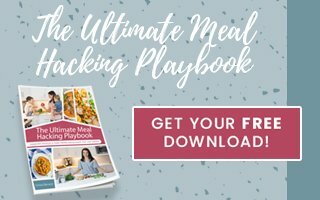 I have been making all your recipes this week and everything is consistently amazing! But I just had to give a shout out to these bad boys, seriously…AMAZING! I so so so appreciate the shoutout and glad you’re a fan! These were soooo tricky to make, but tasted amazing. I was going to have them on hand for lunches, but we loved them so much we ate them up right away. These will be a staple from now on!! Do you have to use tapioca flour? Or can you use something else? Yes, use tapioca flour for these. After making the dough divide into 7 balls and put in refrigerator for about 20 mins. It helps them not stick as much when rolling out. Thanks so much for the feedback Tammie! Just made these for cinco de mayo and oh my goodness they are amazing! My husband, who’s not the biggest Paleo fan, said they may be the best thing I’ve ever made. Thanks so much for creating the recipe. Now I just need to perfect getting them into the pan without breaking and I’m good to go.